…built before the Russian fire? Flotsam for building a barn? When I was a kid I spent my summers at Västanvik on the island of Nämdö. We lived in this house. All houses at Västanvik had different names. This was called Kaptensudden - the Captains Point. There was a small kitchen and a room in an older timbered part of the house but also an extra room that had been added. 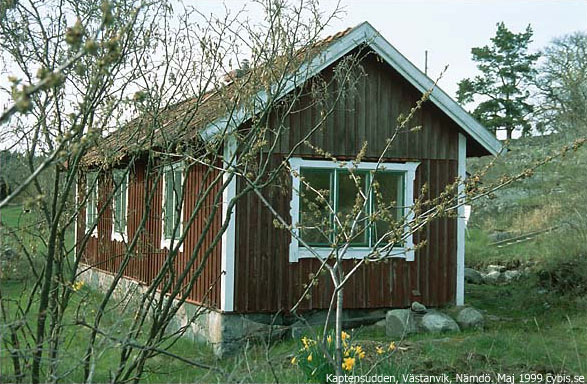 It was rumoured that the house had been moved here over the ice from Skärvassa, a croft on the other side of Nämdö sometime at the end of the nineteenths century. Sometimes we dreamt that it was a really old house which survived "the Russian fire" of 1719 when most houses in the archipelago were burnt down by Russian troops. At an inspection before a coming renovation or demolition of the house it was found that the timber was of different origin. Part of it looked new, part of it looked very old. When the house was demolised one year later, I took a number of samples for dating. The youngest sample (log) is sawn lengthwise. It was cut in the winter 1895/96. This probably means that the extra room was added to the house in 1896 or 1897. Most samples (17) come from logs which were cut in the winter 1870/71. These logs did not grew like timber from Nämdö. They can however easily be dated towards a reference curve from Nämdö. Probably these logs come from the mainland or from another part of the archipelago. one log from Nämdö dated to 1860, both with bark surface (wane). 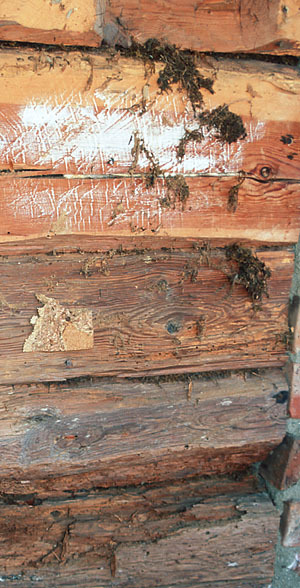 two probably reused logs from Nämdö (from an older building) where sapwood is cut away and where the outer parts correspond to the years 1787 and 1779. I cannot determine how much sapwood was cut away. Perhaps these logs come from a house built around 1820. The selection of logs for sampling was limited by the fact that most logs were in bad condition because of woodworm and decay. All wood in the outer walls had a silver lustre saying that probably the house had been standing some years without covering boards. All datings are reliable. The dated ring width measurements have all been delivered to the ITRDB (swed303.rwl).